Update 10/17/18: A recent Supreme Court ruling removed a hurdle to pursue mold related personal injury claims in Florida state courts. Toxic Mold is a fungal growth that usually can be seen (its usually greenish-black, but it can also be white, gray, black, brown or green, and it can be cottony, velvety, rough or leathery) and has a musty smell. While air testing is important, noticing a musty smell is a pretty good indication that mold exists in the environment. Mold is normally caused by excessive moisture casused by water damage, roof or plumbing leaks and becomes toxic and harmful to humans when it amplifies to abnormal levels. A serious incident of toxic mold can leave a victim with significant medical expenses, lost wages and lingering health problems. Aspergillus – Rare infections caused by aspergillus include pneumonia – people with allergic aspergillosis usually get better over time. It is common for the disease to come back. The simple facts are, that mold needs moisture to grow and it usually grows in drywall, wood, ceiling tile, closets, showers and bathrooms, air conditioning units, plants, drain pans and drain lines, and by or under sinks and toilets. An incident of toxic mold exposure can cause serious long-term health problems, and Alan Sackrin is aware that victims can suffer the consequences of mold exposure for months and even years after the initial illness occurs. What Should You Do If You Believe You Have Been Harmed by Mold? Ideally, its best if you immediately take video and lots of pictures of any water damage, damage to property and anything that you think may be the cause of the problem (the video and your pictures can be used later as evidence). It’s ok if you don’t have a video camera. Also, take pictures of the outside conditions including potential causes of moisture and water damage. Hire a qualified testing company to test the amount, type and levels of mold in the property. Depending on the location of the mold (i.e. at your workplace or office) you may need to consult with a microbiologist or industrial hygienist (according to OSHA, industrial hygienists use environmental monitoring and analytical methods to detect the extent of worker exposure and employ engineering, work practice controls, and other methods to control potential health hazards). If the landlord fixes the problem, then you may not need any additonal help (it depends on the facts – for example, if the landlord knew of the condition prior to renting the property to you, then you may be able to collect damages). Be sure to give notice, in writing, to the Landlord, property manager or other responsible party and keep good records of any written communications you have with the landlord or other responsible party. Keep receipts and make a written inventory of any property that is destroyed or other damages you suffer as a result of the mold, including moving expenses, testing expenses, property damage, hotel bills, restaurant bills or any other expense you incur as a result of the property’s condition. If you become ill because you were exposed to toxic mold, then immediately go see a doctor. If you can, go to a doctor who is experienced with mold injuries, which can include an allergist, pulmonologist or toxicologist. Tenants who live, or used to live, in residential housing. The injuries should be severe (meaning, they caused the tenant to seek medical attention). Homeowners of condominiums with claims against their association, claims against a contractor or developer, claims against other unit owners, or claims against contractors. Workplace Claims – employees or other persons who spend considerable time at a workplace location. From Our Blog: Mold Claims by a Florida Tenant: Can You Sue the Landlord When Mold Is Found in a Leased Home, Apartment, Office, or Condo? 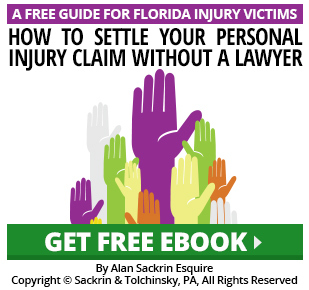 Alan Sackrin’s 30+ years of experience handling Florida personal injury cases makes him qualified to handle even the most complicated cases. Alan is a Board Certified trial lawyer which means he is a trial specialist with an emphasis in personal injury matters. A simple call puts you in contact with a committed, local attorney who will handle all aspects of your matter and work hard to help you get what you deserve. Alan will fight for your rights if you have suffered harm at hands of others in injury matters in South Florida and throughout the state of Florida. If you or a loved one has been injured due to toxic mold, contact Alan Sackrin, an experienced Personal Injury Attorney, today for a free consultation. Contact Alan Sackrin to find out how he can help you. You can contact him by phone at 954-458-8655 or by e-mail through this web site to schedule an appointment and learn more about your rights from an injury lawyer. He offers a free initial consultation. Alan Sackrin adds value to his clients because he will go to trial when the insurance company denies coverage or doesn’t make a settlement offer that he believes is fair. Alan won’t send his client to a different lawyer to file a lawsuit, he’s the lawyer that other lawyers send their cases to when they are unable to obtain a reasonable settlement offer.